Three hundred years ago, on 20 December 1717, Sir George Downing, 3rd Bt, signed the will which would lead eventually – and almost miraculously – to the foundation of Downing College on 22 September 1800. 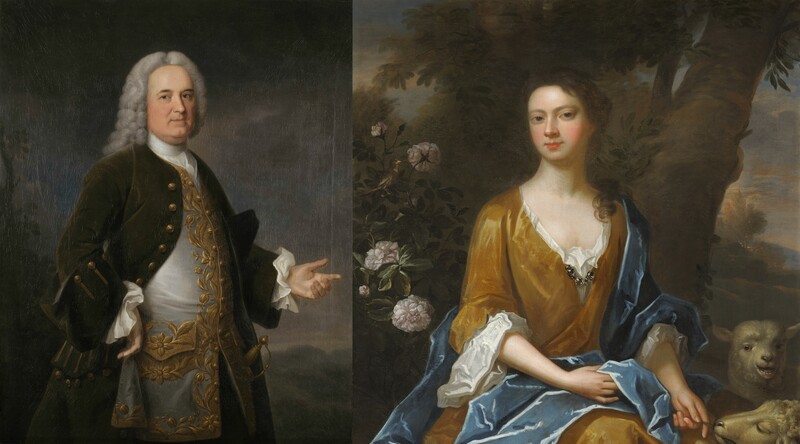 In early 1700, George Downing, heir to the vast Downing family fortune and baronetcy, was married in secret at the age of fifteen to his younger cousin Mary Forester. George then embarked on the customary Grand Tour, asking Mary before he left to refuse any invitation to go to Court. However, his young wife accepted the invitation which came from Queen Anne soon afterwards, keeping her marriage secret, and George heard news of the beautiful new Maid of Honour while travelling. After he returned in 1704, the pair were already estranged with no apparent attempt on either side to reconcile. This unfortunate situation continued until April 1715, when Mary petitioned the House of Lords to have their marriage dissolved because it was never consummated and had resulted in ‘such disgusts and aversions’ that a reconciliation was impossible. The petition was refused because the original marriage remained valid and neither had committed adultery. Sir George (who had succeeded to the baronetcy in 1711) and his estranged wife then jointly petitioned the Lords again in early 1717 for permission to become legally separated. This was approved, meaning that both parties no longer had any financial claim over, or responsibility for, the other. However, it also meant that neither could have legal heirs of their own while the other lived, and so it was that later that same year, Sir George Downing, 3rd Bt, formalised his plans for the inheritance of the vast Downing estates accumulated by his grandfather. He named Jacob Garrard Downing as his heir, followed by Thomas Barnardiston, both first cousins, and then Charles and John Peters, grandsons of his grandfather’s sister Mary. Sir George’s will specified that each had first to change their name before they could inherit, to continue the Downing name. However, Sir George added one significant final provision to his will: that if there were no surviving male heirs, the family name would perpetuate through the foundation of a new college in Cambridge. In 1717, with four young male heirs in line, the likelihood of ‘Downings College’ ever coming to fruition was very small indeed. Mary Forester died in 1734, although Sir George never remarried. 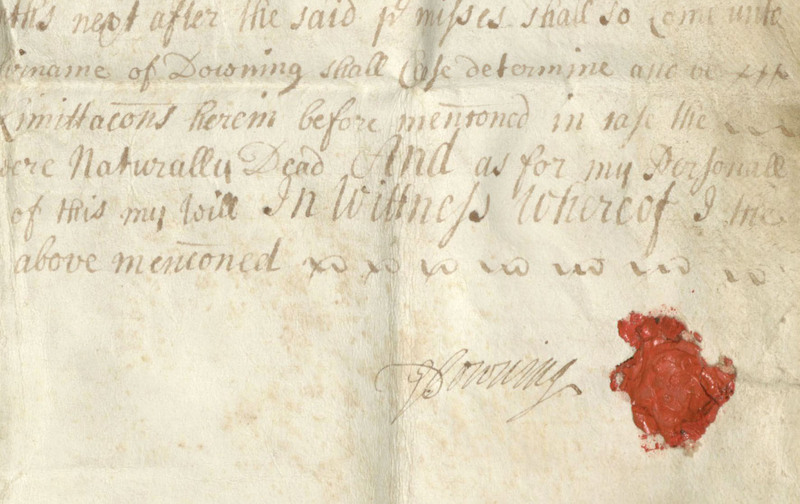 He died on 9 July 1749, survived by all four heirs named in his will. Sir Jacob Garrard Downing inherited the title as planned but when he died, childless, in 1764, the other three heirs were already dead. After a long and complex legal battle with Sir Jacob’s widow, (see ‘250 Years since Downing College wasn’t founded’) with damaging consequences for the financial health of the estate, Downing College was finally granted its Royal Charter on 22 September 1800. Against all the odds, that all important last resort in the Founder’s 1717 will became the permanent perpetuation of the Downing family name he had sought to secure, the first new Cambridge college in over 200 years. An archive exhibition exploring the circumstances surrounding the Founder’s will is located in the Maitland Robinson Library Octagon, together with a major exhibition celebrating ‘300 Years of Giving’ since this significant event in the College’s history. Please contact the Archivist to arrange to visit. French, Stanley, The History of Downing College (Downing College Association, 1978) Download a PDF copy here.